I truely am not a prolific blogger. 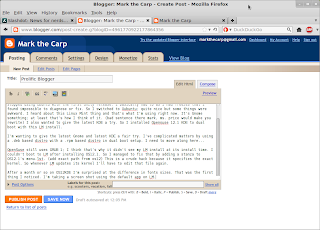 I started using blogger to see how it worked and to specifically write about Ubuntu. Well I stopped using Ubuntu with the first Unity release. I basically had to as I had freezes that I found impossible to diagnose or fix. So I switched to Xubuntu; quite nice but some things were awkward. I heard about this Linux Mint thing and that's what I'm using right now. It's Gnome something; at least that's how I think of it. 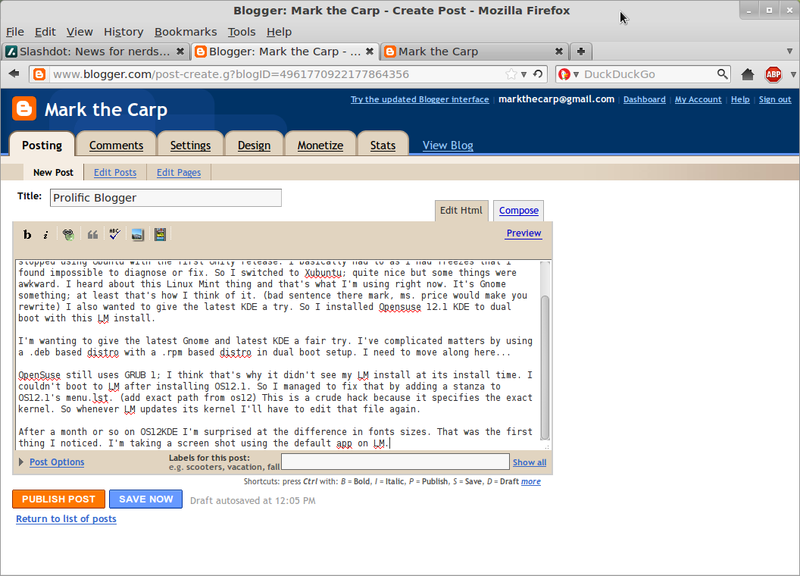 (bad sentence there mark, ms. price would make you rewrite) I also wanted to give the latest KDE a try. So I installed Opensuse 12.1 KDE to dual boot with this LM install. OpenSuse still uses GRUB 1; I think that's why it didn't see my LM install at its install time. I couldn't boot to LM after installing OS12.1. So I managed to fix that by adding a stanza to OS12.1's menu.lst. (add exact path from os12(/boot/grub/menu.lst)) This is a crude hack because it specifies the exact kernel. So whenever LM updates its kernel I'll have to edit that file again. After a month or so on OS12KDE I'm surprised at the difference in fonts sizes. That was the first thing I noticed. I'm taking a screen shot using the default app on LM. 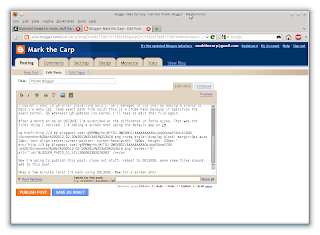 Now I'm going to publish this post; close out stuff; reboot to OS12KDE; move some files around; add to this post. Ksnapshot is hard to find in the OS12KDE menu; I had to search using "screen shot" as my search parameter. Posting to see how they compare. I've added all the links in the first paragraph from OS12.11KDE.